Size, battery life, durability and weight aren’t factors that mean much to a laptop that sits on a desk all day but for those of you who carry an electronic baby on your back regularly, they’re crucial factors to consider before purchasing your next one. 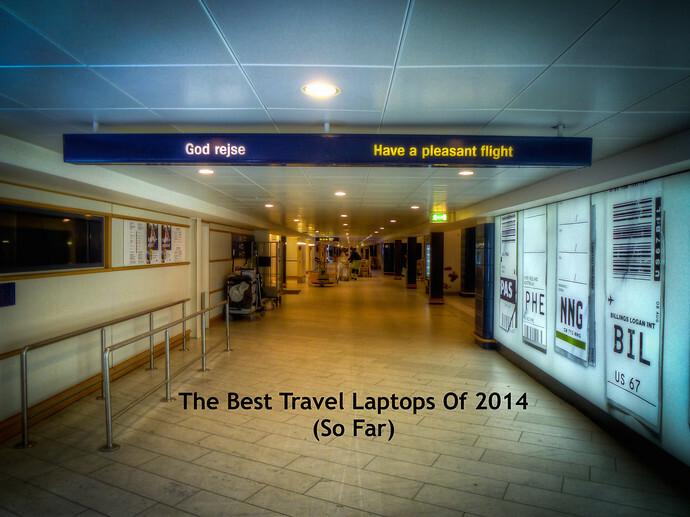 You might be mulling whether or not it’s a good time to upgrade your travel gadgets and in past years when listing the best travel laptops of 2012 I broke them down into categories based on qualities such as price. Now there’s such a convergence of computing power inside slender frames that the following group of laptops should make perfect travel companions, even if they occasionally become homebodies. Although it will upset a bunch of hipsters to say this, Apple products aren’t inherently better than Windows laptops. Deciding if you should buy a Mac or Windows laptop for your travels can be a big choice if it’s a first-time switch but if you’re not operating system biased there is a clear cut choice for all-around travel machine. Macbook Air 11 Inch And 13 Inch (Starting at $899 and $999, respectively) – Still my first choice since I rated it the best travel laptop 2013, both Macbook Air versions have gotten slight upgrades in processing power, memory, and solid state hard drive storage. (For a refresher, I cover what all of that means in The Traveler’s Guide to Choosing The Right Laptop). The changes are moderate enough though if you’re trying to stick to digital travel budget, you can consider a refurbished model from Apple to save 15% or on Amazon for a 20% discount. Keep in mind however that Apple recently reduced prices on the Macbook Air line by $100, making it an ideal time to buy before a rumored (significant) upgrade coming in the next few months. Being thin has it’s travel perks but if you’re like me and prefer an Ethernet port, DVD drive, or simply more digital speed in exchange for a half kilo (~1.5 pounds) plus .75 centimeters (~.3 inches) than I recommend taking a look at the latest 13-inch Macbook Pro with Retina display. Everyone else tired of me sounding like an Apple commercial should read on. Acer Aspire S7-392-6425 ($1,399) – Despite a clunky name the S7 is an efficient 13-inch laptop that’s actually thinner than the comparable 13-inch Macbook Air. At the same weight, what separates the two is a few hundred dollars in price for what is a durable, overall well-designed Windows 8.1 laptop. Microsoft Surface Pro 2 (Starting at $450) Microsoft Surface Pro 3 (Starting at $779) – Prices are dropping quickly on this laptop-tablet lovechild since Microsoft will begin shipping the Surface Pro 3 on June 30, 2014. [EDIT: The Surface Pro 3 is out now and it’s good, very good. A laptop-tablet hybrid worth looking at seriously if you’re on the market for a Windows machine.] With a 10-inch touchscreen plus keyboard the Surface Pro 2 is more tablet than laptop, ideal if you’re going to be using it mainly for emails, Facebook, and tray-table typing. One drawback of the Surface Pro 2 however is that it averages an hour less of battery life than any of the fully grown laptops mentioned above. Lenovo Ideapad U430 ($599) – There isn’t a single feature of this Intel iCore i5-4200U 1.6 GHz thin but slightly heavy 1.5 kilo (~4 lbs) laptop that stands out but together they combine to make an excellent budget ultrabook most travelers will be happy with. Samsung Book Ativ 9 ($1,259) – With close to 9 hours of battery life and impressive 3,200 x 1,800 resolution screen, if graphics are an important part of your mobile work or entertainment, the 13-inch Samsung Book Ativ 9 is a laptop you should strongly consider. Despite being officially designated a laptop-hybrid, the Lenovo Ideapad Yoga Pro 2 ($1,199) is decidedly a laptop that likes to swing tablet on the weekends. Comparable to the Samsung Book Ativ 9 but with about 2 hours shorter battery life, it’s a machine that wins you over once in your palms. The price tag might also help, considering it’s $150 less than the Samsung. Much like cars, peasant foods, or Star Trek costumes and cosplay, there is rarely a single answer to what is the best travel laptop. Choosing a laptop is a personal choice that varies, but as travelers, we’re all looking for many of the same features with a few tradeoffs to be had here and there. Whichever one you decide on, be sure to protect your laptop from the side effects of traveling, setup a backpack security system to keep your bag safe, then lock it down physically and digitally. PreviousDoes Traveling Age You Physically? I’ve got the Yoga 2 13 inch. I love it (I’m a travel blogger too). Paid $1250 at Best Buy and got the Intel i7 processor, 250 gig solid state drive and battery last about 4-5 hours if I’m just doing basic stuff. The folding feature is awesome. I rarely use it as a tablet but I put it in tent mode to watch movies on planes all the time. I switched to a Macbook Air about 18 months ago, and my biggest complaint is the lack of a disk drive and the low storage space. Despite that, the machine runs well and is so easy to carry. I suggest you take a look at the new MS Surface Pro 3. It is basically as fast as a desktop when you purchase the i7 processor. The 256 gig i7 is about $1500 and offers a 12 inch viewing space. It weighs 2.4 pounds with the cover. It’s a multi-touch display, including a pen you can use to markup documents, draw, take notes, etc. And, of course, it detaches from the keyboard easily, allowing you to carry the tablet on the plane and leave the keyboard in your carry on. I turned to a Apple macbook Air about 1 year ago, and my greatest issue is the lack of a hard drive drive and the low storage space space. You’ve got 128 or 256GB now? The macbook still is the best but I love the microsoft surface to. It’s interesting for me that the macbook air was the first one you mentioned. Thanks, I’ll be interested to hear what you ultimately decide on. Love my Mac Air, sometimes I have to stop and just look at it, still amazed by how small it is. Never stopped me worrying about it breaking in my backpack though, touch wood still going strong. I wouldn’t mind getting the Yoga. As of right now, I’m saving up for a new one. I’m almost always on my Lenovo a1000 tablet though. I like to have versatility when doing things for work or leisure.